Pioneering clinical research carried out by the University of Huddersfield, in conjunction with Huddersfield-based Paxman, has confirmed how scalp cooling works. The data, which will be presented at the 14th St.Gallen International Breast Cancer Conference later this month, showed that although chemotherapy drugs are highly toxic to cells, cooling markedly reduced or completely stopped hair follicles from dying. The research also revealed that cooler scalp temperatures achieved by Paxman systems provided better clinical outcomes for patients, helping to change the lives of thousands of cancer patients worldwide. Hair loss is a well-documented side effect of many chemotherapy regimens, with many patients claiming it is the most traumatic aspect of their treatment. The Paxman scalp cooler has been used by over 100,000 patients, in 32 countries and is responsible for helping patients keep their hair and retain normality during chemotherapy. Scalp cooling provides the only real alternative to hair loss resulting in a high level of retention or complete hair preservation, improving patients’ self-confidence and creating positive attitudes towards treatment. 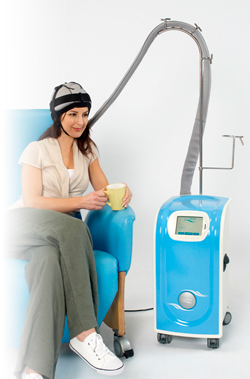 The Paxman scalp cooler works by lowering scalp temperature before, during and after the administration of chemotherapy. Several scientific hypotheses have been raised to explain how scalp cooling works. Firstly, scalp cooling causes blood vessel vasoconstriction, which dramatically reduces blood flow to the scalp and it has been suggested that less chemotherapeutic drug is delivered to the hair follicles. Another possibility is that the rate of drug diffusion across a plasma membrane may be reduced and thus lower ‘effective’ drug doses may enter the cells. Finally it has shown that lowering the temperature in cells can reduce the metabolic rate of the drug. It is possible that cooling involves a combination of these three mechanisms to exert its protective effects. Richard Paxman, managing director of Paxman, said: “We are delighted with the results of the research and are extremely excited that it is being presented at this year’s BCC conference by the University of Huddersfield. The research was carried out by Omar Hussain, research scientist at Paxman and Dr Nik Georgopoulos of the University of Huddersfield.